These are all real accounts of dads who are hit by the baby blues. Research shows that not just women, but men also suffer from postpartum depression after the birth of their child. Postpartum depression is an episode of depression that normally occurs within four weeks of the birth of the child. Fathers tend to feel tired and sad during this phase. They lose interest in activities that they normally like to engage in. There is also a development of extreme anxiety with respect to the child’s well being. Fathers with parental postpartum depression always feel like something bad could happen to the baby. This leads to compulsive behavior like checking on the baby constantly. Research shows that almost 4% to 25% of new dads suffer from postpartum depression. For almost 50 years, research has focused on women with this condition. However, fathers also undergo significant changes in their lives. They may have a hard time adjusting to the demanding life after the birth of the child. Another reason for concern with fathers is that they spend most of their time away from the family because of work. This can make the symptoms worse and impact the family severely. Difficulties in forming a strong bond with the infant. He tends to withdraw from the family suddenly and indulges in more work or sports. You may notice a significant change in the weight. This could be sudden weight gain or weight loss. He will feel very unmotivated when it comes to the family. There is a very obvious change in the sleep pattern. He will complain of stomach issues or headaches often. He may become too dependent on substance abuse, primarily alcohol. It may manifest in the form of violent behavior towards the spouse. You can differentiate between postpartum depression and general stress as the latter goes away when he meets his friends or engages in any activity of his choice. If the symptoms persist, it is a sign of paternal postpartum depression. The primary difference between postpartum depression in men and women is that it manifests more gradually in men. Most men are found to show maximum symptoms of postpartum depression when the child is about 1 year old. They show consistent signs since the time of pregnancy. However, it becomes more severe when the child is older. Maternal postpartum depression is independent of paternal postpartum depression. However, the risk of postpartum depression in men increases by 25% if the mother shows these symptoms. Postpartum depression in men is usually followed by other psychiatric disorders like obsessive-compulsive disorder. This trend is lesser in women and they commonly show signs of anxiety as opposed to compulsive disorders. The most important difference between postpartum depression between men and women is that women tend to be more vocal about their postpartum depression. Men find it a lot harder to talk about it and it is necessary to ask them questions directly to understand what they are exactly going through. How to deal with postpartum depression? The most effective way of dealing with postpartum depression is to talk it out with a professional. Support from the spouse is vital during this time. A stressful period has a lot of negative impact on the family. Therefore, timely action and consultation plays a significant role in managing and curing postpartum depression in men. Usually, this involves couple therapy as the first thing that is strained by this condition is the relationship between the parents. Good rest is also advised when you are going through postpartum depression. In some companies, the concept of paternal leave does exist. Make the most of it when it is available. In severe cases, anti- anxiety medication may be prescribed to alleviate the symptoms of depression and anxiety. 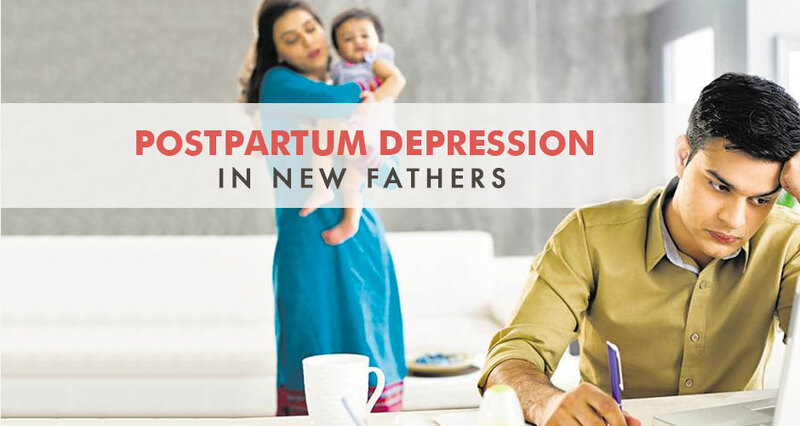 Dealing with paternal or maternal postpartum depression is necessary as it can even have repercussions on the behavior of the child in the future. When left untreated, it can cause irreparable damage to the family. The good news, however, is that this condition can be managed with necessary help.